I want to share with you a recipe I made last night, that is really easy and absolutely delicious. What I love about this dish is the combination of the various flavours of the herbs that give it the freshness and the lemon zest adding a slight bite and aggressiveness. The sweetness of the dried apricots and cinnamon provides you with the warmth and comfort which will simply leave you wanting for more. Butternut squash is low in fat, and contains an ample dose of dietary fiber, making it a friend to your heart and digestive system. It is loaded with beta-carotene, the pre-cursor of vitamin A, providing with about 354% of RDA (recommended dietary allowance). Beta-carotene is a powerful antioxidant, and your body needs it to maintain the integrity of your skin. It is also very important for your eyes and vision – truly a beauty food! This is my take on a recipe from the Ottolenghi cookbook, and here is what you will need to make it. Preheat the oven to 180 degrees C. Place the diced onion in a pan with 1 tsp of coconut oil and a pinch of salt. Sauté over a high heat stirring frequently for about 5 minutes. Add the pine nuts to the onion and leave on for another 4-5 minutes until the onion is golden brown. Set aside. Mix the diced squash with 1 tsp coconut oil, and some salt and pepper. Spread the squash out on a baking tray, place in the oven and bake for about 25 minutes, until lightly coloured and quite soft. In the meantime, pour some hot water over the dried apricots, just to cover them. Soak them for 5 minutes, drain and cut them into 5mm dices. Cook the couscous. Bring the stock to the boil with the saffron. 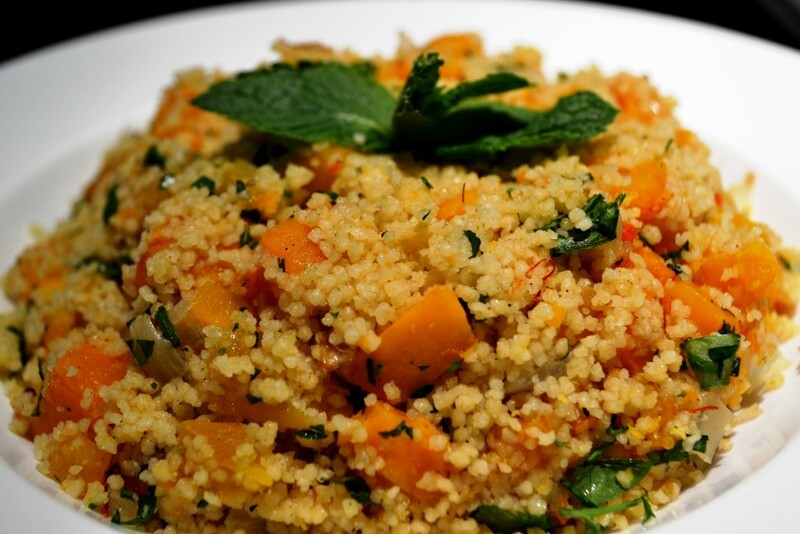 Place the couscous in a large heatproof bowl and pour the boiling stock over it, and add the 2 tbsp of olive oil. Cover with cling film and leave for about 10 minutes until all the liquid is absorbed by the couscous. With a fork whisk to fluff up the couscous, then add the onion, apricots, herbs, cinnamon and lemon zest. Mix well and then add the butternut squash. Mix again, trying not to mash the squash. Taste and add more salt and pepper if needed. Serve cold or slightly warm. That sounds amazing! I love adding dried fruits to my quinoa salads and I imagine it would be similalr here.